Calling all science nerds! We have the PERFECT thing for you. With quotes included from famous scientific thinkers including Leonardo Da Vinci and Marie Curie, impress your peers with these forward thinking postcards. 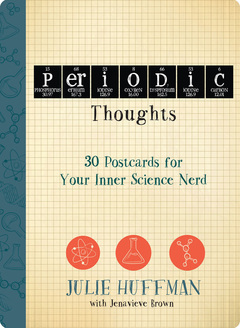 Periodic Thoughts is the perfect combination of eye catching art that will also help you embrace your inner nerd. With each card designed using different elements from the Periodic Table of Elements, these 30 different postcards are the perfect way to send your friends and family a letter, as well as impressing them with all your newfound scientific knowledge. So what are you waiting for? At this rate, you could become the next Isaac Newton! Sometimes you just need to talk science, and what better way to say, “hey,” to a fellow nerd than with these perfect Periodic Thoughts postcards. Embued with scientific quotes and laws, each card is designed using different letters from the Perdiodic Table of Elements.